This post was updated April 19, 2018 to include new products. 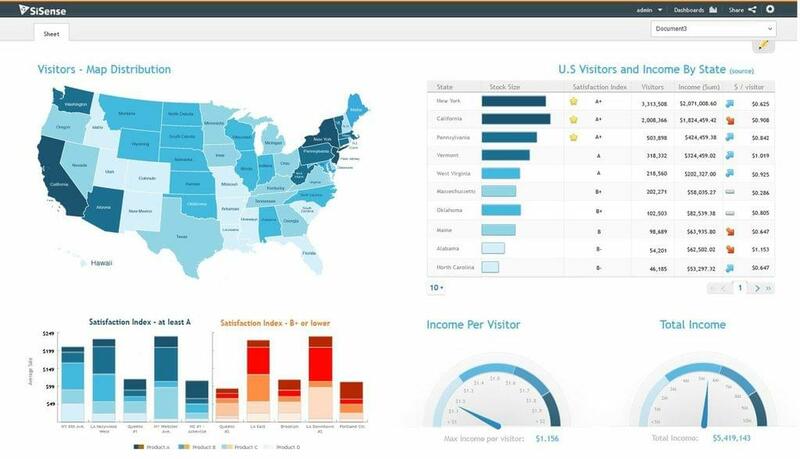 Tableau leads the business intelligence (BI) software pack with its well-designed interface and fast reports. They also provide online and in-person platform education from Blue Ash, Ohio, to Dubai. But Tableau may not work for every company. It costs a lot to implement and maintain, and you do need to know (or have someone on hand who knows) how to run SQL queries for customized workflows. There are plenty of BI tools on the market that require minimal or no IT oversight to run. Whatever your reasons for researching Tableau alternatives, you’ll find a lot of options. Use our Product Selection Tool for Business Intelligence Software to get a custom recommendation based on your needs, or click the image below to get started. Domo is a data aggregation and visualization tool that brings together data from across the company for use by all business units. The software boasts over 500 data connections that update in real-time and extensibility through SKD and Design Studio for custom connections. All of this connected data is then made available in a visual editor that eliminates the need for special coding knowledge from anyone who interacts with the data. The Domo platform takes a mobile-first approach to building data visualizations, ensuring that your charts look good wherever you need to access them. The platform’s focus on accessibility extends to their real-time exceptions notifications. Alerts bring stakeholders to the data, while the data-centered chat gives teams a way to collaborate from anywhere. Leave a review for Domo. GoodData offers two major products: an end-to-end data platform and embedded analytics. These two work on the GoodData security structure that runs the gamut from HIPAA to GDPR and financial data regulations. The platform gives companies a full data management and analysis system that runs on any data source. This software provides the architecture for data integration, cleansing, analysis, and publication to reporting tools and apps. The scalable enterprise platform lets companies use their data to grow in new, stable, and innovative ways that protect the company’s data but drive toward insight. GoodData’s embedded analytics are perfect for smaller corporations looking to improve data analysis and access but who can’t commit to a full end-to-end data management system. The analytics use the GoodData platform as a service model to get companies up and running quickly, sometimes within a matter of days, and without hiring data scientists. Leave a review for GoodData. 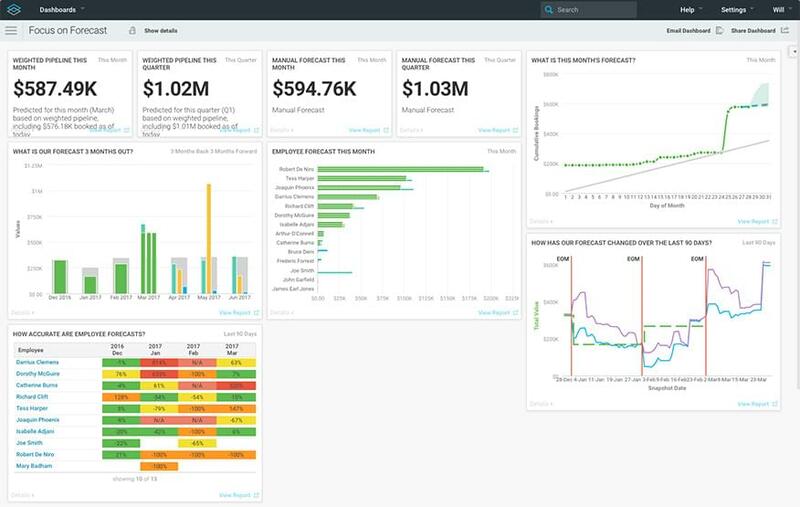 Dundas Data Visualization’s product, Dundas BI, is an interactive and responsive dashboard and reporting program that scales from dashboards to data analytics and platform controls that manage all points of the data chain. Easily scale your BI program by adding as many servers and data sources as needed. Dundas is built for enterprise companies and those with advanced data needs, but the user controls react to the skill levels of the users, giving access to business data processing and analysis to individuals across the organization. 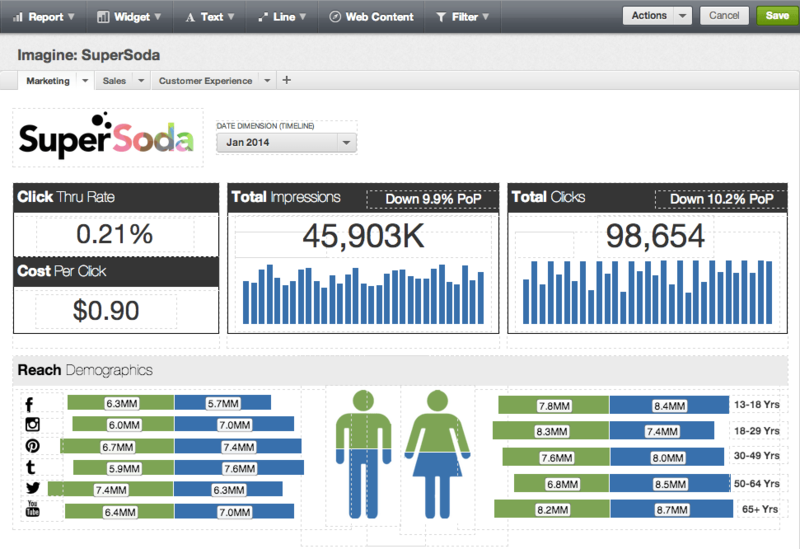 Look to the embedded analytics tools to raise the bar of customer and client interaction. Embedded analytics let you take data out of the business silo and provide a fuller experience and better communication with customers. Leave a review for Dundas. InsightSquared is a sales-focused data visualization company that aggregates and provides a platform for business users to better understand their data. The software is split into two main products: Tiles and Slate. Each of these is built to scale to the business needs. 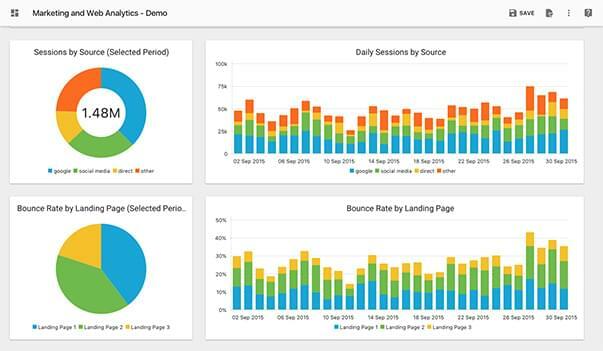 Tiles is a sales analytics tool built specifically for Salesforce data. Access ready-made reports populated with historical Salesforce data that easily manipulate for sales insights. Choose from sales, sales development, demand generation, or SaaS analytics tools that are ready for Salesforce data out of the box. Slate is the custom analytics platform. InsightSquared provides the data warehouse, and technical users import, cleanse, and prepare data for business use. Non-technical users can then access the data in a ready-to-report form that requires no additional technical knowledge on the part of the user. Leave a review for InsightSquared. 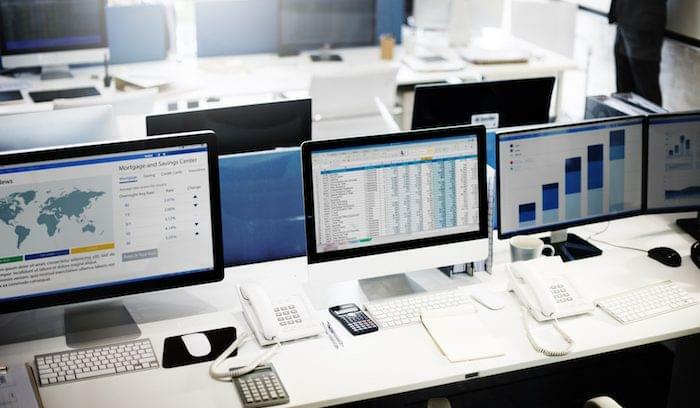 SAS Business Intelligence and Analytics (also called Visual Analytics) is just one of the many data processing and analytics tools available from SAS, which specializes in building enterprise-ready tools for users across industries. Choose the right tool or set of tools from SAS based on your business and technology needs and the maturity of your data program. 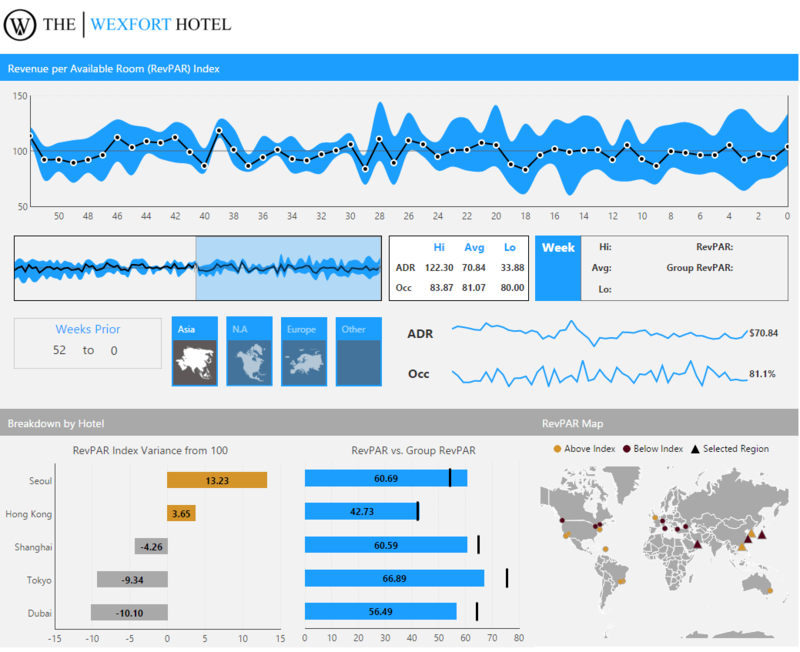 Look to the Visual Analytics program to gain business analytics without tying up IT resources. The system is built for business leaders and technical data analysts to work in tandem, with IT controlling governance but business guiding the the data visualization process. SAS also integrates with MS Office programs like Excel and Outlook to keep data in the hands of those who need it most. Leave a review for SAS. Looker is a business intelligence and data visualization platform made for companies with an existing data analytics team. Use their LookML to define business data, and then business users have the freedom to combine, drill down, and analyze that data in real time in dashboards and reports. 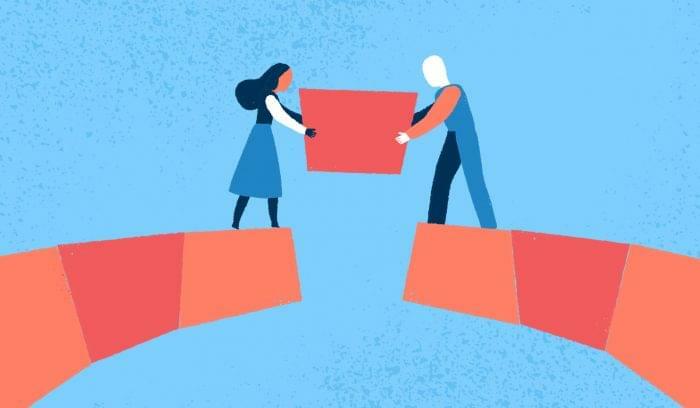 Looker connects to existing company databases and keeps data up to date, and business users can use natural language that matches with the company’s custom LookML settings to build their own reports. Looker translates the LookML data into SQL queries that pull the right information without bothering the technical analysts. Leave a review for Looker. Sisense is well-known in the BI space and often cited as a Tableau alternative because of its onboarding ease and single-stack technology. This is another option that gives you access to all of your data without the need for IT or data professionals to manipulate it first. They promise a 90-minute introduction to the tools with your own data, which seems to reflect the low barrier to entry. 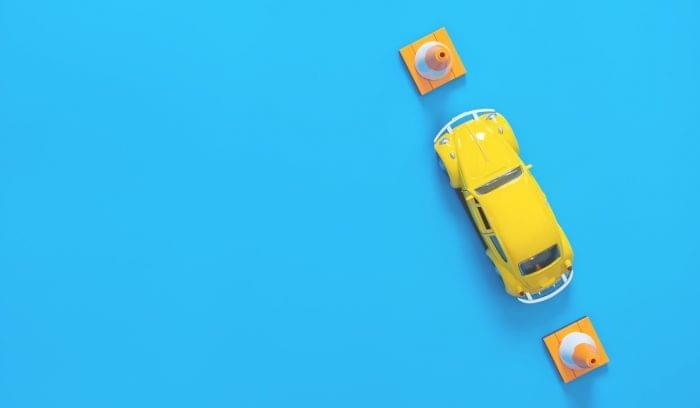 Sisense brings together a lot of the features you find in other programs on this list: non-technical dashboard, lots of native connections, real-time data aggregation, alerts, and notifications. It also gives enterprise and Big Data folks some options with its scalability to millions of lines of data and API customization options. Leave a review for Sisense. Spotfire aims to democratize data across your organization by giving access to all employees, rather than forcing you to make requests through your IT or data teams. They provide cloud, platform, enterprise and AWS-focused systems for BI from lots of disparate data sources. Spotfire’s extensive capabilities include both Big Data and what they call “Big Content.” With Big Content searching, you can analyze all user-generated text across multiple platforms including email, chat, and search terms. Big Content searches help identify customer pain points and possible solutions. 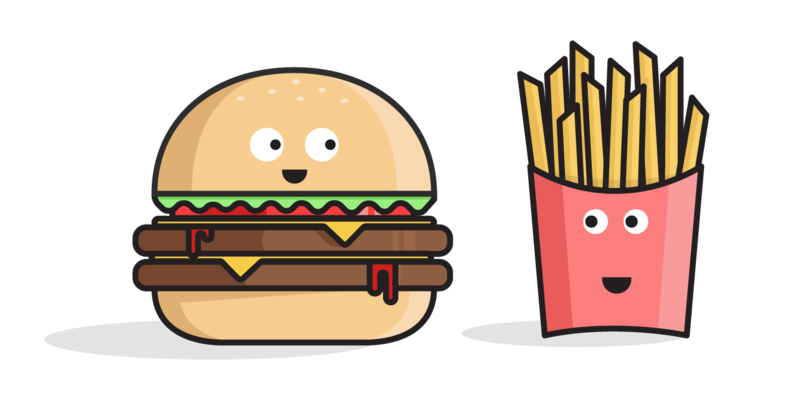 To sweeten this deal even further, Spotfire provides predictive analysis from your data, so you can be proactive rather than reactive. Leave a review for Tibco Spotfire. Viur’s major strength comes in the form of a dashboard-to-email automation that gives you scheduling capabilities over your report data. With Viur, your data runs and aggregates silently and publishes when you need it based on preset rules, rather than forcing you to run a new report. 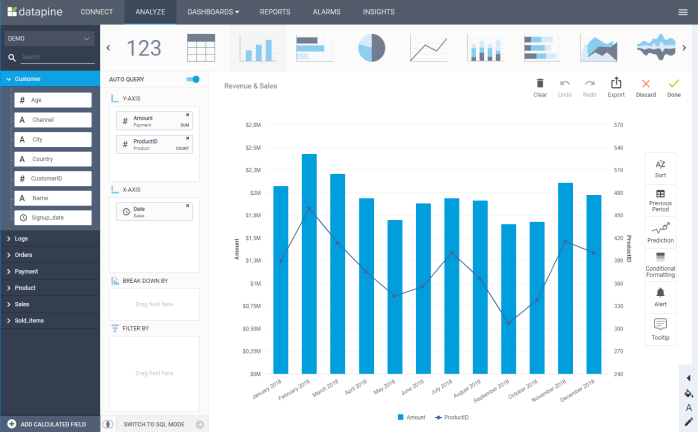 Like other options in this category, Viur offers responsive reports that look good on every device, as well as a visual dashboard creator that gives you a wide range of report types. This software requires some SQL expertise for greater customization than the out of the box reporting options, but educational resources and contract analysts will help you learn and maximize your use of the software. The Viur team understands security, so they let you own your data and store it in a secure location that suits your needs. The software encrypts connections from your database all the way through reports to keep your information safe. Zebra BI’s interface resembles a plug-in more than an a separate platform you connect to data sources. The entire system bolts onto Excel, so a spreadsheet-heavy workplace doesn’t have to learn new tools. On the downside, if your data doesn’t exist in Excel format, you’ll need to import it. Zebra provides new chart types that you can’t find in Excel, and those new charts live in the same place as the originals. That means you just select your data and choose the chart from the Tables option. Zebra also offers data scaling to ensure your data isn’t skewed. Need to update a chart from a presentation? No problem. Zebra automatically updates linked PowerPoint slides when you make a change in your chart. Smart and easy to use, Zebra works for companies new to BI or those who do a majority of their work in Microsoft Office. Birst’s multi-tenant cloud architecture aggregates your data with cloud, AWS or locally, and also offers a desktop client. The company employs strict security standards throughout their data centers and encryption in the cloud to keep your data safe. Because your data travels between the cloud and your local databases, you can access all of your data and visualizations from any device. Run your analyses with visual discovery dashboards that make your data more accessible. This reduces the need for IT interventions or extensive training to use the product. Leave a review for Birst. 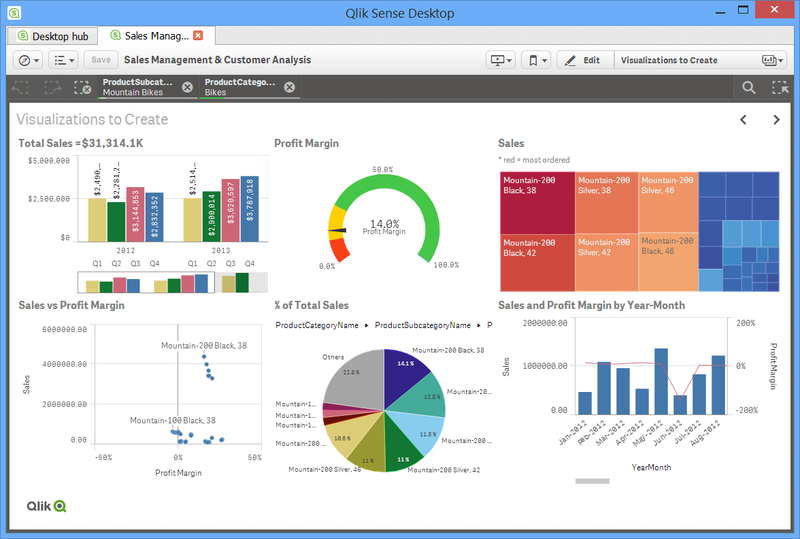 Qlik’s data visualization features intuitive data building, that’s interactive and contextual. Native search gives you easy access to all of your existing data, while a centralized visual library lets you view and copy visualizations that your teammates have already built. Customization over the API is available with developer access. Qlik stands out from the competition with its contextual data. Access huge databases of information from public sources, or purchase market information from Qlik’s DataMarket. These connections to outside data sources could cement this option as the winner for companies and individuals who do a lot of market research and comparisons. Leave a review for Qlik. Part of the Microsoft suite of business tools, Power BI is built specifically for data analysis and visualization. While providing the usual dashboards and reporting features, Microsoft’s Power BI also gives you the ability to embed data within your apps — an integration that others on this list don’t offer. With 60 data sources, the native connectors aren’t overwhelming, but you can search and combine data with question-based analytics. E.g. “What’s the average order total for customers from Toledo, Ohio.” Microsoft Power BI offers a free trial with an upgrade to the business version. You can use this tool in conjunction with other Microsoft Business Application systems including PowerApps. Leave a review for Microsoft Power BI. KiniMetrix built its BI software with the salesperson in mind. This program specifically examines sales data and strives to help you identify sales openings and improve profit margins. Segment your reports to learn about individual customers, persona groups, transactions, or salespeople. KiniMetrix’s model gives you the freedom to run the software on its own, or alongside other BI solutions. In addition to all of the export and downloading capabilities you’d expect, KiniMetrix integrates well with other BI and sales programs. If you need some help working the product or don’t have the resources to spend on in-house analysis, KiniMetrix professionals can help you build your dashboards and sales improvement strategies. Datapine helps non-technical folks build visualizations from different types of data by merging sets without restructuring the database to make them match. 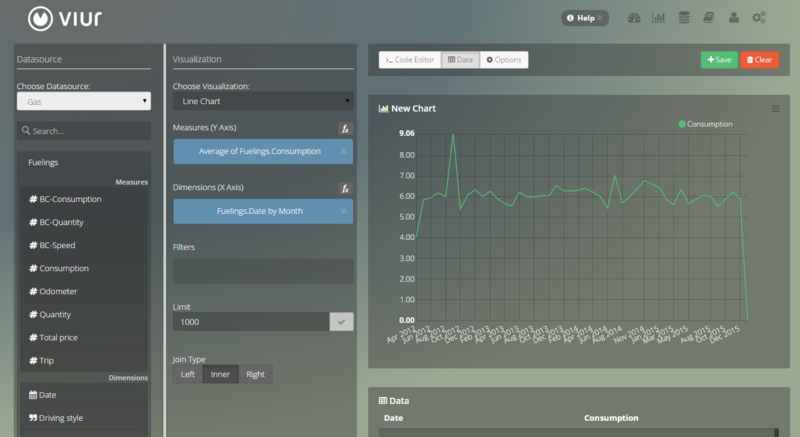 The tool’s native connectors let you build visualizations from a dashboard without needing to consult developers. Datapine’s focus on ease of use extends to pre-built, industry-specific dashboards that you can customize to your needs. There’s a long list of native connections for lots of platforms that you use daily, and you can export all of your visualizations to presentations or an external, shareable URL. 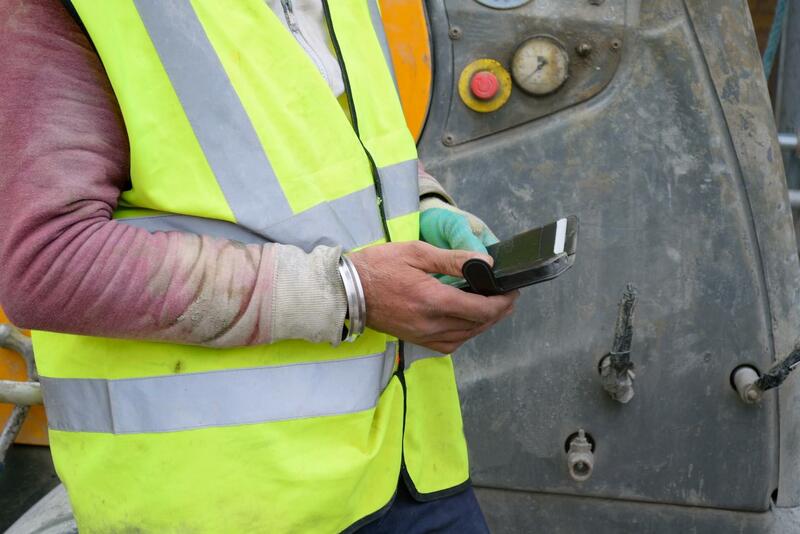 You won’t feel tied to your desk with datapine’s mobile building and viewing capabilities. Slemma fills the BI niche for e-commerce and website-based businesses with lots of blogging and e-commerce data connections. You can also connect to existing databases including SQL to build mobile and sharable dashboards. While it doesn’t monitor your data 24/7, Slemma gives you a scheduled data refresh option. Brand your visualizations with a custom domain before you share them. Slemma built their platform with your security in mind: they get read-only access to your data, so you still own it in its original form. You can also upgrade security with SSL and tunnel connections. These 16 are by no means the only Tableau alternatives. 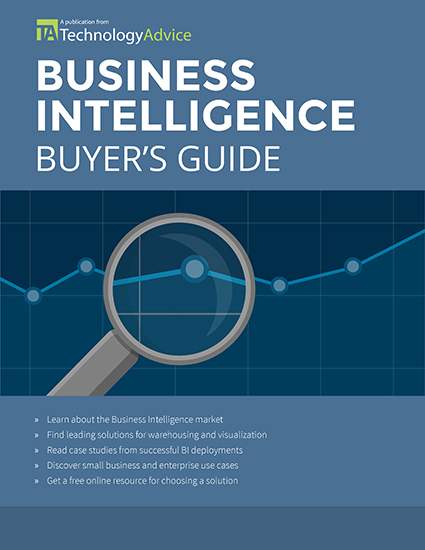 There are plenty of viable solutions in the business intelligence software market, but there’s also a high learning curve that keeps many buyers from doing enough research. Feeling confused? Call one of our tech advisors for a free consultation, or use our Product Selection Tool to get a custom recommendation based on your needs.